NEW YORK (AP) — William Shakespeare’s comedy “Much Ado About Nothing” benefits from a lighthearted approach and an evenly-matched pair of verbal jousters to conduct a battle of the sexes. An accomplished, zestful production by Theatre for a New Audience that opened Sunday at The Duke on 42nd Street contains all that and more. Directed by Arin Arbus, the polished presentation is set just before World War I in Sicily. Arbus, who also directed Shakespeare’s “Othello” and “MacBeth” for the same theater company, here creates another dynamic, stylish staging. With minimal set and few props, the eloquent language and the actors’ considerable talents become the focus. Jonathan Cake and Maggie Siff, photographed at The Duke on 42nd Street. Photo by Gerry Goodstein. Siff is confident and sarcastic as the woman Benedick calls, “my dear Lady Disdain,” yet she also captures the subtleties of her character’s ambivalence. Cake enlivens his roguish character with engaging animation, appealing directly to the audience with winning assurance. The scenes where each of them comically crawls around the side of the stage while miming bewildered eavesdropping are masterfully executed. The other lovers, chaste Hero and proud young Claudio, are given naive sincerity by Michelle Beck and Matthew Amendt. Robert Langdon Lloyd is quite amiable as Hero’s father, Leonato, until he erupts sensationally in a furious tirade when Hero is dishonored at her wedding altar. As annoyingly addled constable Dogberry, John Christopher Jones is quite a scene-stealer, even when John Keating is lurking onstage in his inimitably goofy way. There are several soldiers of various rank, led with gravitas by Graham Winton as goodly Prince Don Pedro and Don John, his scheming, black-hearted brother. Kate MacCluggage and Elizabeth Rouse as a duo of good-humored housemaids brighten the proceedings. The plot, aptly summed up by the title, contains the usual Shakespearean mixture of disguises, identity mix-ups, villainous deceit, non-villainous deceit and an innocent party wrongly accused. That’s followed by a faked death, some comical, bumbling rustics and eventually, remorse, joy and a few merry jigs. 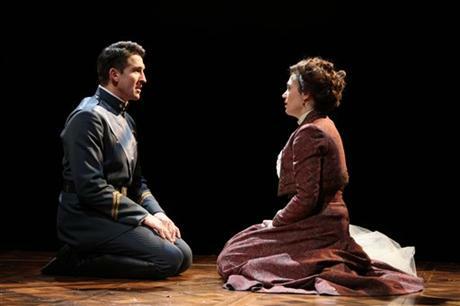 “Thou and I are too wise to woo peaceably,” Benedick tells Beatrice rather belatedly, but in this buoyant presentation, the audience wouldn’t have it any other way.